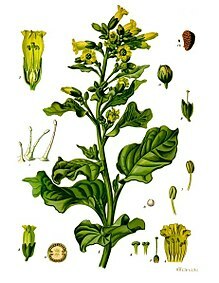 Nicotiana rustica (binomen a Linnaeo anno 1753 statutum) est species plantarum florentium in America media sponte crescens quae pharmacum praebet in culturis indigenarum huius regionis inter entheogena ritualia adhibitum. 1597 : John Gerard, The Herball, or generall historie of plantes pp. 284-285 "Of yellow henbane or English tabaco"
Vicimedia Communia plura habent quae ad Nicotiana rustica spectant. Vide Nicotiana rustica apud Vicispecies. Novissima mutatio die 25 Augusti 2018 hora 19:49 facta.